Softie Bat Monster Free Pattern « think liz. The pdf pattern can be accessed here (right click and hit ‘save link as’ to save the file) and you can print it on 11×17 paper. Cut the pattern out (you have the option of cutting on the fold or not – I felt like that wings were too complex for me to cut on the fold). Carefully cut out two pieces of fabric from the pattern piece and then place them right sides together, pinning the edges. Sew a 1/4″-1/8″ seam around the edges (back-stitching at each end), leaving a 3″ opening on the side of his head to turn the softie right side out. I found the need to use a smaller seam allowance and slowly stitch the area around the wings. Fill with stuffing, concentrating first on filling the feet, wing tips, and ears and then slip stitch the opening closed once stuffed to your liking. Embroider on a face, sew on buttons or felt, add clothing, whatever you want to do to finish off your monster! 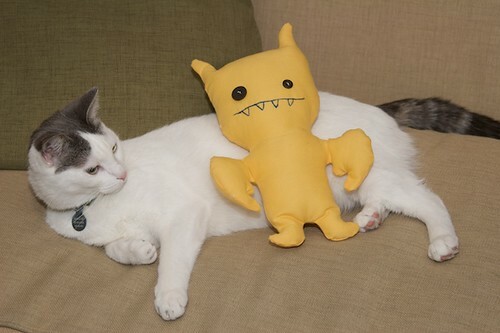 Add your pictures of your monster to the Softie Bat Monster Flickr Group! I would love to see pictures if anyone ends up making this so please let me know if you do! Please feel free to use this pattern for gifts, yourself or toys for your children/animals! Please do not sell anything made from this pattern or promote it as your own. This entry was written by Elizabeth, posted on February 13, 2009 at 12:41 pm, filed under Crafts, Free Pattern, Sewing and tagged Crafts, free, free sewing pattern, monster, Sewing, softie, softies. Bookmark the permalink. Follow any comments here with the RSS feed for this post. Post a comment or leave a trackback: Trackback URL. Such a cute softie, (your kitty is lovely too!) thanks for sharing.